Poland is celebrating the 100th anniversary of regaining independence this year. The process of shaping the state borders lasted for several years and was very dramatic. 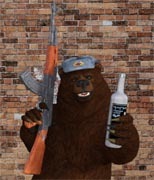 One of its elements was the Polish-Bolshevik War, which ended with the defeat of Soviet Russia. In this topic I will show my figurines from that period. 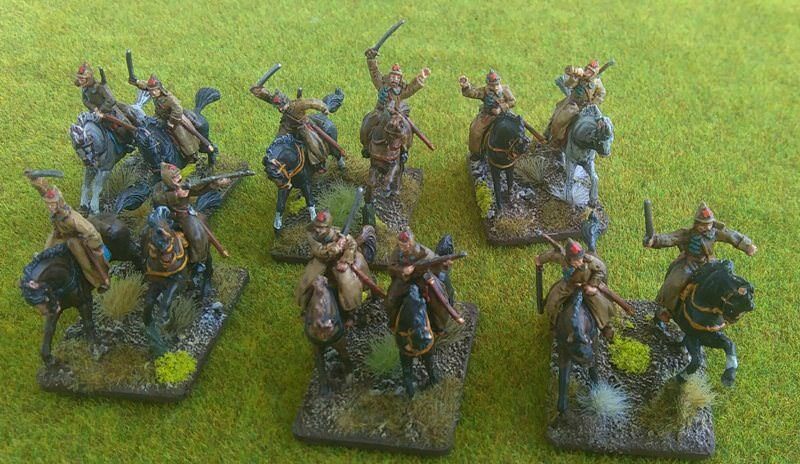 The first is the horse army of Budionny. (set 72011 by Orion). I based minis on the 3x4 cm bases for wargame rules written by http://greenminiatures.com/ company. 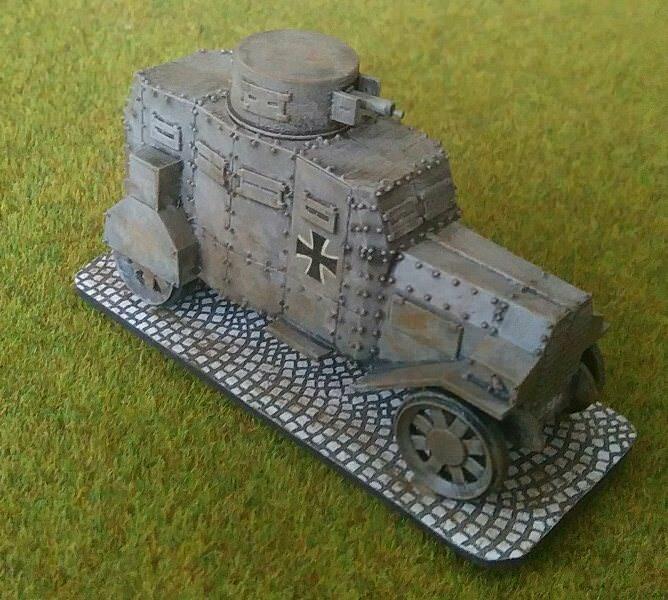 They have growing range od WWI minis in white metal in 1:72 and beautiful resin armored cars. Excellent painting of some great figures! 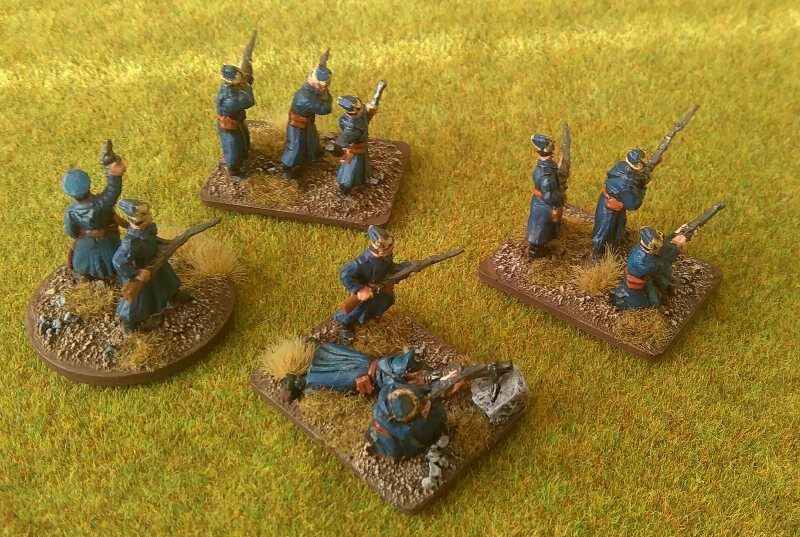 I have these and the recent Strelets Red Cavalry as well as their Haller's Polish Blue Army infantry set. The only thing that puzzles me are the red stars on the budenovka hats. All the sources I can find show blue as the arm-of-service colour for Red cavalry which was seen on the chest and collar tabs as you show but also the hat stars. Well that was the regulation but, due to shortages, regulation uniform such as the chest tabs are rarely seen in photographs of Red troops on the front line. Durruti - thank for your kind words. Red stars appeared on hats, also on the left shoulder. Sometimes the red star had a blue border, which is not so easy to paint. But given that this war is often called in Poland as the War of white eagle against red star, I painted the stars in red. The first company of the blue army. I can not paint a white eagle in a tiny red field on a hat and sleeve, which is why it looks like a cotillion. Figures come from Strelec M130 WWI Polish Infantry (Blue Army) set with the addition of several figures from the set M126 Serbian Infantry in Winter Uniform. Thanks to Serbs set (some figures in helmets) I have lot of the poses. sowabud wrote: Red stars appeared on hats, also on the left shoulder. Sometimes the red star had a blue border, which is not so easy to paint. Not "sometimes", but "always" - for cavalry (crimson - for infantry, orange - for artillery...). Metal red star was small, so in 1/72 blue star (without red center) is enough. Of course, if to forget about political componenta and make a pure HISTORICAL diorama. 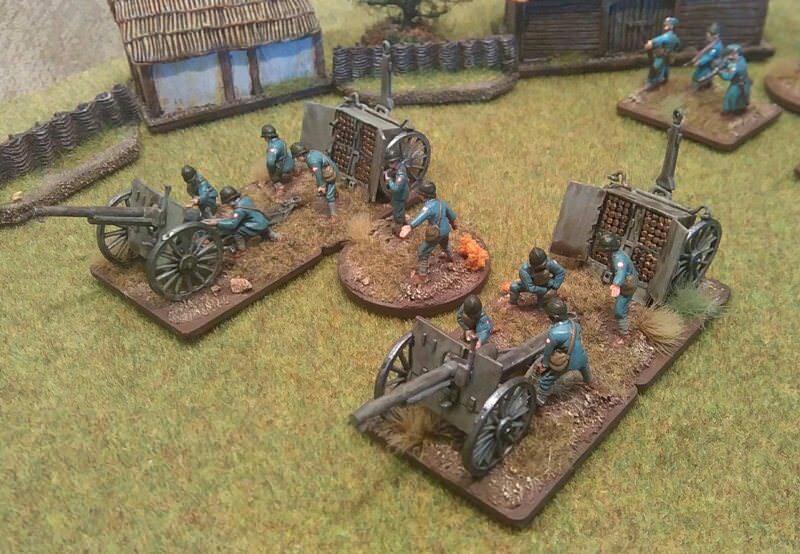 MicroWorld, hopefully you can help about Red Army artillery - the sources I have say they had orange arm-of-service colours but changed to black (like engineers). I can't find a date for when this happened - any information? Currently I'm thinking that changes were slow to happen so orange is best. Durruti wrote: MicroWorld, hopefully you can help about Red Army artillery - the sources I have say they had orange arm-of-service colours but changed to black (like engineers). I can't find a date for when this happened - any information? Currently I'm thinking that changes were slow to happen so orange is best. Black color for artillery was introduced in 1922. After the outbreak of the Wielkopolskie Uprising (western Poland), Ehrhardt armored cars were used in battles against insurgents. On February 7, 1919, one of such cars was captured by an insurgent unit. By order of the commander of the Wielkopolska Army the car was called Colonel Kazimierz Grudzielski. On 19-20 March car took part in the battle near Zamość against German troops supported by an armored train. During the Third Silesian Uprising the car was directed to Silesia. The squadron of armored cars participated in battles in the region of Kędzierzyn on May 5-7, 1921, and on May 21 at Żyrow. Interesting topic and great figures. 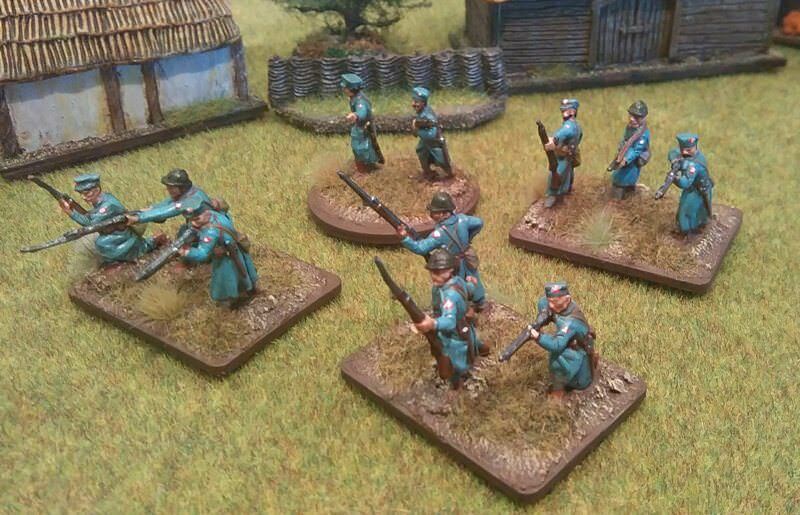 Your work on the 'blue army' is terrific, nice use of the Serbian figures with them. 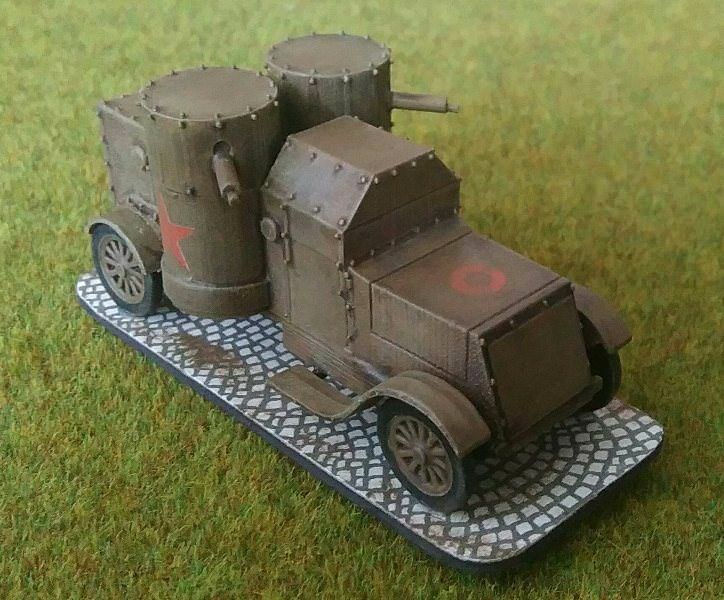 One more freak from GreenMiniatures - Austin Mk I painted as post british Red Army armored car. Very beautiful, these early armoured cars! Hi, great to see new a new update with figures! 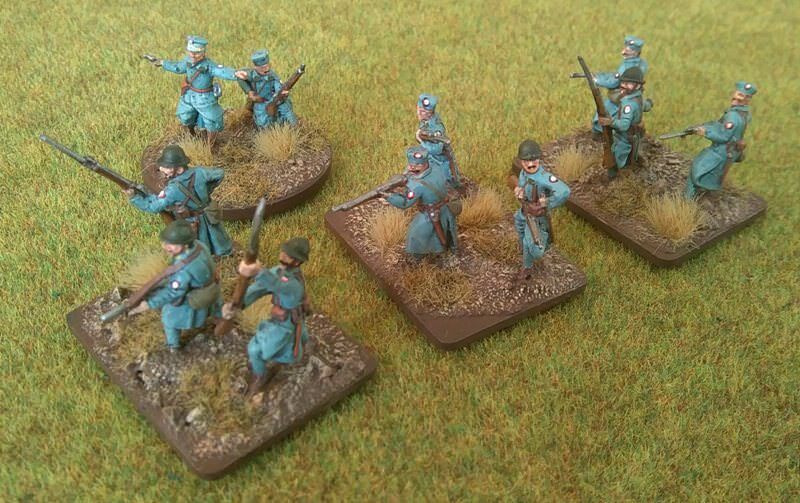 Have to say these actually look like the Ukrainian "Blue-coat" Divisions which according to Osprey Men-At-Arms 412 "Ukrainian Armies 1914-55" (page 11) were formed by POWs in German camps in 1918. POWs in Austro-Hungarian camps were formed into the "Grey-coat" units. Yesterday in Poland we celebrated the 100th anniversary of regained independence. On this occasion, in the evening before this holiday, I put to my blog next photos of my project - the artillery of the Blue Army. Guns and figs came from the HAT 8161 set. Another compamy of my Blue Army. First time I have made hats from green stuff.